The famous Blickensderfer typewriter was cheap compared to regular keyboard typewriters in its day, but still the Blickensderfer company decided to produce a stripped-down version of the machine to service the lowest end of the market. They called it the Niagara and sold it starting in 1902 for 15 dollars. 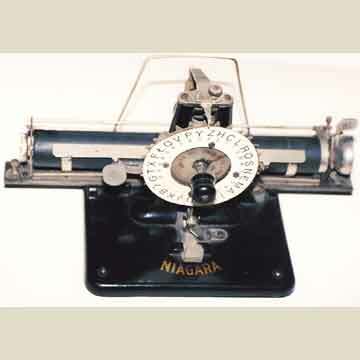 The Niagara was made of left-over parts for a failed product, a cipher machine that Blickensderfer had tried to launch in 1901 (See the book TYPEWRITER, page 158). The Niagara consisted of the carriage, escapement and typewheel of the Blickensderfer typewriter. But in stead of keys, there was a circular index that could be turned to select a character. The Niagara is quite rare, although it also appeared as the Stella and was even sold by Sears & Roebuck as the Best typewriter. Note in the pictures the portrait of the family that originally owned this machine.